Kick off your visit on the 2nd (Fri): explore the wealth of natural beauty at Nuuksio National Park. Here are some ideas for day two: browse the eclectic array of goods at Hakaniemi Market, test your problem-solving skills at popular escape rooms, then make a trip to Porvoo Old Town, then get engrossed in the history at Seurasaari Island and Open-Air Museum, and finally look for gifts at TeeMaa Tea House. To find reviews, more things to do, photos, and more tourist information, read Helsinki holiday maker website . Melbourne, Australia to Helsinki is an approximately 22.5-hour flight. You can also do a combination of train and flight. The time zone changes from Australian Eastern Standard Time (Victoria) to Eastern European Time, which is usually a -8 hour difference. While traveling from Melbourne, expect much colder days and a bit cooler nights in Helsinki, ranging from highs of 10°C to lows of 1°C. Finish up your sightseeing early on the 3rd (Sat) so you can catch the train to Tampere. On the 4th (Sun), identify plant and animal life at Seitsemisen Kansallispuisto. On your second day here, kick back and relax at Riihiniemen Uimaranta, look for all kinds of wild species at Hatanpaa Arboretum, and then stroll through Pyynikki Park and Observation Tower. To find ratings, traveler tips, maps, and other tourist information, refer to the Tampere trip itinerary maker site . You can take a train from Helsinki to Tampere in 2 hours. Alternatively, you can drive; or fly. In October, plan for daily highs up to 8°C, and evening lows to 0°C. Wrap up your sightseeing on the 5th (Mon) early enough to take a train to Turku. Start off your visit on the 6th (Tue): step off the mainland to explore Vepsa Island, get engrossed in the history at Turku Castle, and then contemplate in the serene atmosphere at Turku Cathedral. Get ready for a full day of sightseeing on the next day: browse the collection at Turku City Library, make a trip to Naantali Old Town, and then tour the pleasant surroundings at The Archipelago Trail. For reviews, more things to do, traveler tips, and more tourist information, use the Turku trip itinerary maker website . Take a train from Tampere to Turku in 2 hours. Alternatively, you can drive; or do a combination of train and flight. In October, plan for daily highs up to 10°C, and evening lows to 1°C. Finish your sightseeing early on the 7th (Wed) to allow enough time to travel to Kuusamo. Kuusamo is a town and municipality in Finland. 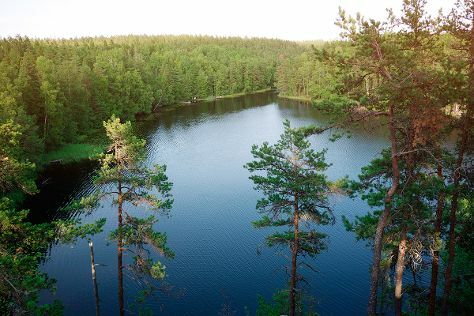 On the 8th (Thu), admire the masterpieces at Hannu Hautala Nature Photography Centre, then explore the stunning scenery at Kiutakongas Rapids, and then hike along Pieni Karhunkierros Trail. Get ready for a full day of sightseeing on the 9th (Fri): explore and take pictures at Palosaari Reindeer and Fishing Farm, then identify plant and animal life at Wildlife Areas, and then look for gifts at Shopping Center Kumpare. To see photos, more things to do, ratings, and more tourist information, use the Kuusamo road trip planner. Getting from Turku to Kuusamo by flight takes about 4.5 hours. Other options: do a combination of train and flight; or drive. Traveling from Turku in October, things will get slightly colder in Kuusamo: highs are around 3°C and lows about -1°C. Wrap up your sightseeing on the 9th (Fri) to allow time to travel to Koli National Park. Eschew the tourist crowds and head to Patvinsuon Kansallispuisto and Ukko-Koli Hill. Get outdoors at Akka-Koli Hill and Paha-Koli Hill. To find maps, ratings, and other tourist information, read Koli National Park route builder app . You can drive from Kuusamo to Koli National Park in 5 hours. Another option is to fly. In October in Koli National Park, expect temperatures between 6°C during the day and 0°C at night. Finish your sightseeing early on the 12th (Mon) to allow enough time to travel to Imatra. 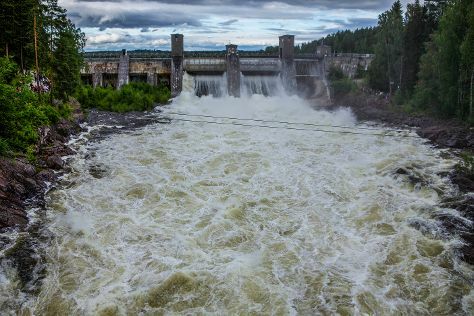 Although predominately an industrial town, Imatra boasts a long and impressive history of tourism, largely owing to its fierce rapids, considered to have been Finland's first ever tourist attraction. On the 13th (Tue), admire the sheer force of Imatra Waterfall, contemplate in the serene atmosphere at Church of St. Nicholas, then step off the mainland to explore Malonsaari, and finally explore the activities along Siikalahti Wetland. Get ready for a full day of sightseeing on the next day: stroll through Lammassaari Island, get outside with Atreenalin Seikkailupuistot, then take an in-depth tour of Wolkoff House Museum, and finally pause for some serene contemplation at Nuijamaa Church. For reviews, photos, and tourist information, use the Imatra driving holiday app . Getting from Koli National Park to Imatra by car takes about 3.5 hours. In October, daily temperatures in Imatra can reach 7°C, while at night they dip to 1°C. Cap off your sightseeing on the 14th (Wed) early enough to go by car to Kotka. Kotka is a city and municipality of Finland.Kotka is located on the coast of the Gulf of Finland at the mouth of Kymi River and it is part of the Kymenlaakso region in southern Finland. Get in touch with nature at Arboretum Mustila and Hiidenvuori. Discover out-of-the-way places like Niivermaki Nature Conservation Area and Linden Esplanade. There's much more to do: identify plant and animal life at Riverside Park, admire the natural beauty at Fuksinpuisto Park, appreciate the extensive heritage of St. Nicholas Orthodox Church, and enjoy the sand and surf at Beach Mansikkalahti. To see other places to visit, ratings, maps, and tourist information, go to the Kotka trip planner . Traveling by car from Imatra to Kotka takes 2 hours. Alternatively, you can take a train; or take a bus. Expect a daytime high around 8°C in October, and nighttime lows around 1°C. On the 17th (Sat), wrap the sightseeing up by early afternoon so you can travel back home.